The start of a new school year is an exciting time for students, full of anticipation and promise. This statement is especially true for the K-5 students in Arlington, Virginia attending Discovery Elementary School. Not only are the students attending school in a brand new building, Arlington County’s first new elementary school in more than ten years, they are attending school in a net-zero energy building. In fact, Discovery Elementary School is expected to be the first net-zero energy school in the Commonwealth of Virginia, as well as the largest in the United States and the first in the entire northeast. Discovery Elementary School was conceived and built out of a need to address Arlington Public School’s (APS) growing student enrollment. The new school project provided an opportunity for APS to incorporate sustainability into its design, and to design the school for the highest standard possible: net-zero. With a limited budget, the district initially set its sights on achieving a Leadership in Energy and Environmental Design (LEED) Silver rating. The project architect, VMDO Architects, believed they could do even better and stay within budget. To achieve a net-zero energy building, VMDO partnered with CMTA Engineers. CMTA had previous experience with net-zero energy schools, having designed the first net-zero energy school in the United States (Richardsville Elementary in Bowling Green, KY). The net-zero energy school in Arlington was designed so the amount of energy produced by onsite renewable sources exceeded the amount of energy used. By working together, VMDO and CMTA were able to incorporate many energy conserving measures, including the construction of a geothermal well-field under the school’s playing fields and the installation of approximately 1700 solar panels on the school’s roof. John Chadwick, APS’s Assistant Superintendent for Facilities and Operations, was instrumental in selecting VMDO to head up the project and had this to say in a recent article by WAMU American University Radio: “It was actually the team that we picked that thought this school could be a candidate for net-zero energy, so they really brought that to the table. 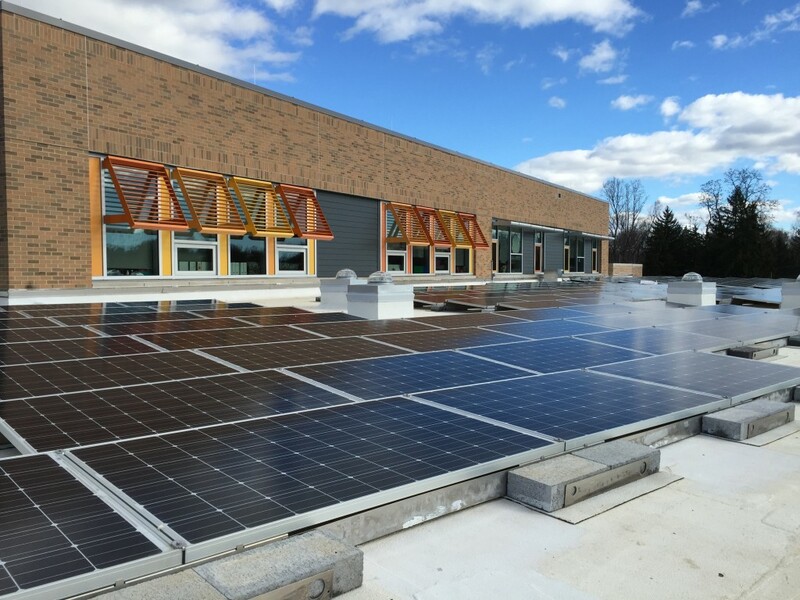 We had very high standards for sustainability but we actually hadn’t considered going that far.” Discovery Elementary School joins a list of only 38 other net-zero energy buildings in the United States, only 4 of which are K-12 schools. A solar thermal water heating system is used in the school’s kitchen. Water is circulated from the storage tank and through flat-plate solar collectors to produce pre-heated water. This pre-heated water is then introduced into the geothermal water heating system, which supplies heat at a consistent 120°F. This process reduces the energy load on the geothermal heat pumps and allows solar energy to play a key role in heating water for use in the school’s kitchen. The low-flow plumbing fixtures that are installed throughout the school have flow rates that exceed the energy- and water-savings targets mandated by APS. It is estimated that 288,700 gallons of water will be saved per year, 36% lower than a building equipped with baseline, standard-flow fixtures. Discovery Elementary School’s design incorporated lots of daylight to encourage a vibrant learning environment while reducing the need to use artificial light (and thus, electricity). The school has 100% LED lighting and uses occupancy and automatic lighting controls to conserve electricity in unoccupied rooms. Bioretention basins have been constructed on the school grounds to help clean and slowly release water from the school site. These basins are also used by teachers as a learning laboratory for their students (see below for more about Discovery Elementary School’s unique learning environment). Rainwater from a small section of the school’s roof is directed to a pair of 132-gallon rain barrels. The rain collected in the barrels is used to water the school garden, which also functions as an outdoor classroom. Discovery Elementary School was named as a tribute to astronaut John Glenn, who lived across the street from the school site at the time he became the first American to orbit the Earth in 1962. Thus, it is fitting that Discovery Elementary School has adopted an innovative, inquiry-based learning environment for its K-5 students. Each grade level is assigned a theme that reinforces the curriculum and moves from a micro-level to a macro-level scale: for example, Kindergartners start in the backyard and each grade on up through 5th grade expands outward in the solar system. The school building and grounds provide numerous hands-on learning opportunities for teachers and students alike. In addition to using the geothermal well-field and bioretention basins for classroom lessons, teachers can use a rooftop solar lab to teach their students about light and energy. The solar lab is connected to a digital dashboard that tracks energy usage and other statistics, enabling teachers to use real data in their lessons. The school even has a built-in solar calendar that is coordinated with an inlaid stone pattern on the school’s plaza to help students tell time and mark the changing seasons. The benefits of operating a net-zero school go beyond maintaining a carbon neutral footprint. Most notable are the financial benefits: a school of similar size to Discovery Elementary has approximately $120,000 in annual energy costs. Discovery’s energy innovations are projected to reduce that cost to $72,000 a year. The money saved is returned to the school district’s operating budget, allowing the district to reinvest that money back into the school and its students’ education. A less tangible benefit is the impact of the building on the students. By including features throughout the school that emphasize sustainability and inquiry-based science lessons, students are more engaged in their learning and have adopted a sense of ownership and pride in their school’s energy efficiency efforts. In fact, students are measuring more than just energy. For example, a scale is being used in the cafeteria to determine how much food waste is being created, as well as how much leftover, uneaten food can be saved for donation. Students at Discovery are not just adopting a new mindset when it comes to sustainability; they are adopting a stewardship ethic and a lifestyle that will serve them and the planet well into the future. Before adopting new energy goals, especially those around net-zero strategies, be sure to communicate with everyone in the school community, including administrators, facilities staff, teachers, and students. Becoming more energy efficient often forces people to go outside their comfort zones and rethink how they carry out routine activities. Make sure everyone is on-board and understands what is being asked of them. Having a baseline for your current energy use will help you determine where you are and identify realistic energy efficiency/net-zero energy goals. Once you know your energy baseline, you can use that data to formulate a plan for energy efficiency/net-zero energy initiatives. How is the school currently using energy and what steps can the school take to reduce its energy usage and operate more efficiently? Philip’s passion for high-performance building design elevates projects that act as teaching tools, enhance curriculum, and produce meaningful learning environments. In his 5 years at VMDO, Philip has been involved in the design of several LEED Gold and higher projects. 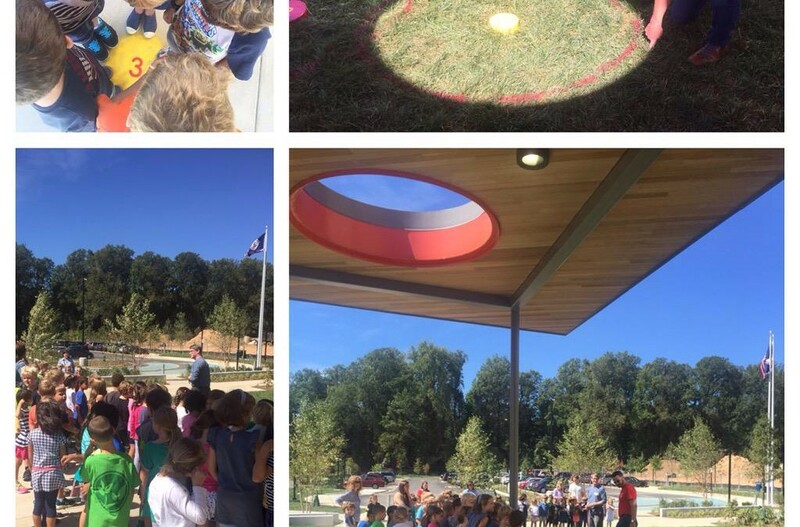 Most recently, Philip was a Project Architect for Discovery Elementary School which is anticipated to become the first net-zero energy school in Virginia and the largest to-date in the United States. In his 8+ years with VMDO, Wyck has served as a project architect and manager for VMDO’s most highly acclaimed K-12 projects – those incorporating innovative design measures relating to sustainability, environmental stewardship, and innovative learning environments. Wyck’s first two school projects with VMDO were the 2nd and 3rd LEED Gold public K-12 schools in Virginia. His most recent project, Discovery Elementary School, is anticipated to become the first net-zero energy school in Virginia and the largest to-date in the United States. Wyck has presented at conferences across the country, including Greening America’s Schools at Sundance and most recently, at the 2015 Green Schools National Conference and Green Schools State Legislative Summit. Mr. Hans joined CMTA’s Louisville office as a Project Manager and an Electrical Engineer in 1998 and became a partner in 2003. As CMTA’s National Director of Sustainable Projects, Mr. Hans works with architects and owners to increase the potential of projects to be sustainable. He has worked on the majority of CMTA’s Net Zero Energy projects including Richardsville Elementary School, the first net-zero energy public school in the United States. Mr. Hans has spoken at many regional and national conferences on the subject of net zero energy buildings, including Greenbuild 2012 and 2015; the Society of American Military Engineers (SAME) Technical Training Conference in Savannah, GA; the National Building Institute’s Net-Zero Building Webinar; the AIA’s Gulf Coast Green Conference Texas; Lightfair International; and the BICSI Telecommunications conference. Mr. Hans recently led the electrical engineering department at CMTA’s Louisville, Texas, and Indiana offices and has been involved in all of CMTA’s signature design projects. He has in-depth knowledge of sustainable systems and works with owners and architects to structure funding arrangements for renewable energy. Mr. Hans is a licensed professional engineer in over 46 states as well as in Puerto Rico and Canada. Interview with Bob Crowell, Principal, 2rw Consultants, Inc.
Bob Crowell co-founded 2rw Consultants in 1985 and has served ever since as Vice President and managing principal in charge of design. He is a registered professional engineer in thirteen US states, a LEED Accredited Professional, and spends most of his time on the planning and technical aspects of design projects focused on the integration of sustainable practices and efficient technologies. He directs all aspects of HVAC, plumbing and electrical systems design, and quality control for 2rw’s engineering design studio for a wide range of facilities including K-12 and higher education; health care; multi-family housing; and athletic, corporate, and military buildings. Under his leadership, 2rw has engineered building systems for 44 LEED-accredited projects. Pauly, Megan. “Arlington’s Discovery Elementary Being Built as First ‘Net Zero’ School in Virginia.” WAMU 88.5 Metro Connection. April 17, 2015. Smith, Max. “New ‘Net-Zero’ Elementary School Set to Open in Arlington.” WTOP News. September 2, 2015. Arlington Discovery Elementary School. VMDO Architects. “Arlington to Debut Net-Zero Energy Elementary School.” Green Building News. November 19, 2014. While I applaud the attempt to reduce energy consumption, I have to question the term “Net-Zero” when the stated energy cost estimates are still 60% of what a comparable school would consume. ($72,000 vs. $120,000) Would that not be “Net Sixty”, or did I miss something? Thanks for your question, Gene. Most people understand money more than BTUs or KwH, so this article used money instead of actual energy used in our description of the reduction of costs to the district ($72K per year vs. $120 K per year). I believe that is why we confused you! Net-zero schools are designed to be net-zero users of energy. The energy costs that we referenced, are different and vary widely due to demand charges, transmission charges, required monthly minimums and other issues that do not allow for a pure, dollar-for-dollar net metered arrangement. Most net-zero energy buildings still end up with some power bill, especially as utilities often won’t pay anything if a school produces excess power. In this case, Discovery Elementary is tracking to be a net-zero user of energy, and may be net-positive – putting more clean, renewable energy on to the grid than the energy they take from it. According to Wyck Knox, of VMDO, Discovery produced enough excess energy in April to power a typical American home for 1 year. We apologize for the confusion…but are excited that you read the article and provided us the chance to help you understand the difference between net-zero energy and the reduction in costs for energy bills that this initiative is providing to their district. Enjoyed the article and history on the Discovery Elementary School. As two years have passed since this article, can you provide an update on the net zero status and annual utility cost? Nov 29, 2017 Education Week says Discovery is net positive.